Extreme makeover and home improvement shows have left many people dreaming of having the ultimate gourmet kitchen. Unfortunately, the kitchens you see on TV are far from attainable for those on a budget. Visions of all of the tools and ingredients you need to create an impossible array of delicacies can have you overspending before you know it. While there are many affordable ways to remodel your kitchen, I like to focus on infrastructure and ingredients. By putting practicality first, you can create a gourmet space without blowing your budget. Here are my top six strategies to make that happen. One of the most stylish and affordable kitchen design strategies is to put the food items you cook regularly on display. Bowls of fruit, baskets of garlic and red onions, glass mason jars of beans, and garlands of dried peppers all lend color and style to your gourmet kitchen while remaining completely functional. Bonus? You won’t have to worry about keeping up with changing out your seasonal decorations, because you’ll naturally be buying those food items anyway. Pumpkins and other winter squash will likely be gracing your counters in the fall, while apples and cherries will have their turn during the warmer months. And pepper corns – don’t forget the peppercorns. They’re a hit at any time of year and taste great when freshly ground over a variety of foods. Those giant, built-in, electrically wired custom islands might make you drool, but there are plenty of other ways to have a great-looking kitchen island on the cheap. A rustic, rectangular farm table from an antique shop (or a reproduction of one from your favorite furniture store), stainless steel restaurant work stations, or any number of free-standing pieces with a work surface could be used. Another fun idea is using an older waist-high bureau that you’ve refinished to coordinate with your gorgeous gourmet kitchen project. Put glass or granite on the top, attach some towel bars to the sides, and add castor wheels. You’ll have a functional kitchen island that moves when you need it elsewhere (like a backyard party serving station), and storage to boot. All of those drawers are great for kitchen linens, hostess platters and tons of items that don’t fit easily into typical kitchen cabinets. I’m not saying overstock to the point of being cluttered, but there are definitely some doodads that make cooking significantly easier and less stressful. Slotted spoons, cherry pitters and plane graters come to mind. Hitting places like Ikea, and restaurant supply stores is a great way to get what you need for cheap. Believe it or not, antique stores are also a fantastic place to purchase kitchen gadgets and utensils secondhand. While those hand-finished pieces of oaky goodness may cost a mint, the kitchen stuff like antique carrot peelers, and enamelware with great patina, are usually dirt cheap. They also make your kitchen look like you’ve been cooking for years even if you haven’t. Just be sure to inspect and clean each piece thoroughly before actually using it. Anything with rust or a chipped finish should be strictly decorative. I gotta come clean. I love this free standing, industrial style metal shelving. It’s modern, flexible, and can be brought home or delivered in a flat box. Less than a hundred bucks per set, it can also be upgraded inexpensively with rolling wheels, extra shelves and pull-out drawers. You might worry about it looking stark and cold, but it’s far from it. In fact, mine gets compliments from everyone who visits. You can warm it up with hanging baskets, hang hard-to-store utensils from the sides with s-hooks, and even create custom storage for your dishes by adding extra, adjustable shelves. The add-on features at Lowe’s usually run around fifteen bucks a piece, including the wine rack and bar glass storage piece I picked up. But the best thing about them is how easily they go together. A rubber mallet is all you really need. And perhaps a frosty six pack. Show off your beautiful dinnerware, rather than stowing it away where nobody can see it. Bright colored, affordable, open cabinetry with different sized storage compartments is a super stylish way to go. I’ve seen this trend in numerous loft-style apartments, as well as on a fair number of television shows. If you’re going for bold pops of color, this can really work for you. Sure, those TV kitchens have crazy high-end appliances and custom fixtures, but what’s behind those pricey cupboard doors? Part of a gourmet kitchen that often goes overlooked are the actual cooking ingredients within that kitchen. The absolute best way to get gourmet ingredients affordably is to buy in bulk. Warehouse stores have great deals on long-lasting artichoke hearts, sundried tomatoes and capers by the mega jug. Ethnic groceries are a great place to get large amounts of special spices, and natural food stores are the perfect spot to stock up on those organic French lentils and quinoa for cheap. Stocking up on gourmet ingredients also means that when you have a busy week, or are an extra tight budget, you can still pull off fantastic meals quickly and affordably – think unusual pasta toppings or killer pizza combinations. Having a stocked pantry is a blast, and a great motivator to skip that restaurant takeout. Remember, gourmet refers to a love of food and cooking, not a roomful of uber-expensive gadgets. A true chef can create a multi-course dinner on an apartment-sized stove if need be. Focus on functionality first, then get creative. In the end, you’ll have a truly unique space that works for you, on a dime store budget. 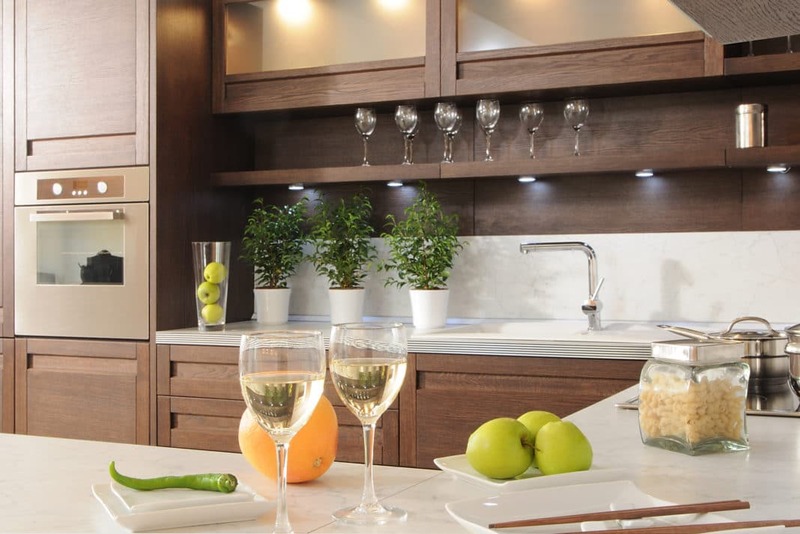 What have you done to create a gourmet kitchen in your home for cheap?